Copyright: © 2016 Hajj-boutros R, et al. This is an open-access article distributed under the terms of the Creative Commons Attribution License, which permits unrestricted use, distribution, and reproduction in any medium, provided the original author and source are credited. Objective: The aim was to compare the ability of liraglutide 1.2 mg daily to improve glucose control in overweight prediabetic compared to overweight normoglycemic subjects. Research design and Methods: We followed 100 overweight individuals (mean age, 44 ± 12 years) treated with liraglutide 1.2 mg daily over a period of 18 months. Based on their HbA1c, they were divided in two groups: prediabetes group (A) and normoglycemic group (B). All subjects were advised to decrease calorie intake by 500 kcal/day. Weight, BMI, waist circumference, blood pressure, HbA1c, lipid profile and TSH were assessed. Results: Six of 45 individuals (13%) in group A discontinued the study during the 18 months period compared with 8 out of 55(14%) in group B (P=0.46). Subjects in group A (n=39) lost the same percentage weight as those in group B (n=47; 5.8 vs. 7.3%; P=0.26). The percentage change in BMI was similar in both groups A and B (5.8 vs. 7.7%; P=0.19). The percentage drop in waist circumference was less in group A compared to group B (5.1 vs. 8.1%; P=0.04). The drop in HbA1c was higher in group A compared to group B (0.3 vs. 0.1%; P=0.04). The percentage of patients that regressed to normoglycemia in group A was 15% whereas the percentage of patients that progressed to prediabetes in group B was 8%. Only two subjects progressed to diabetes in group A and none in group B. There were no differences between the two groups with respect to percent changes in BP; triglycerides; total, LDL and HDL cholesterols; and TSH. Pre-diabetic subjects with any of the metabolic syndrome components (group A1) lost more percentage weight compared to those without any of the metabolic components (group A2) (7.3 vs. 4.8%; P=0.05). The percentage change in BMI was more in A1 compared to A2 (7.4 vs. 5.0%; P=0.03). The percentage drop in waist circumference was similar in A1 compared to A2 (7.0 vs. 6.2%; P=0.4). The drop in HbA1c was higher in A1 compared to A2 (0.4 vs. 0.08%; P=0.04). Conclusion: The addition of liraglutide 1.2 mg daily to calorie restriction to both pre-diabetic and normoglycemic overweight subjects resulted in a significantly more beneficial glycemic control in the pre-diabetic group despite a lower reduction in waist circumference and a similar reduction in body weight. Liraglutide resulted in normalization of glycemia in 15% of these pre-diabetic subjects and in this group, the presence of any of the metabolic syndrome component results in further weight loss and a better glycemic control. Approximately one-third of adults in the United States have pre-diabetes and are in the overweight non-obese range [1,2]. They are at risk for type 2 diabetes (T2DM) and cardiovascular disease (CVD) . Weight reduction has been shown to prevent T2DM [4-7] and to improve CVD risk factors  in the prediabetes population. In the Diabetes Prevention Program study, a 7% weight loss was associated with a significant reduction in T2DM incidence . In the intensive lifestyle arm, half of the individuals were able to attain this weight reduction at 24 weeks, and only 38% attained this level at 3 years. In the self-guided weight loss programs, the percentage that can achieve a 7% weight reduction may be estimated to be <20% . The glucagon-like peptide 1 (GLP-1) analogue, liraglutide, is already approved for the treatment of T2DM and for obese nondiabetic people. It improves glucose tolerance, and is associated with weight loss in individuals with T2DM . Few studies have evaluated the effect of GLP-1 action in individuals without diabetes [10-12], and no study focused on a small dose of 1.2 mg daily of liraglutide in overweight individuals with pre-diabetes. The purpose of this study was to compare the ability of liraglutide 1.2 mg daily to improve glucose control and prevent diabetes in overweight pre-diabetic subjects and to compare this effect to overweight normoglycemic subjects. We assessed men and women from a single center, aged 19-75 years, with BMI between 25 and 35 kg/m2 with either prediabetes or normoglycemia treated with liraglutide 1.2 mg daily based on an ongoing off-label clinic weight loss protocol from July 2013 to December 2015. Pre-diabetes was defined as having an FBS between 100 and 126 mg/dl with an HbA1c between 5.7% and 6.4%. Normoglycemia was defined as FBS less than 100 mg/dl with an HbA1c less than 5.7%. All individuals also had to have a stable weight (<5% reported change) in the previous 3 months and accepted to take liraglutide 1.2 mg daily to loose weight on an off-label basis. The following subjects were not included in the study: those that use other medications that can affect weight loss; subjects with gallstones, history of pancreatitis, medullary carcinoma, family history of medullary carcinoma or multiple endocrine neoplasia type 2; and subjects known to have cardiac, liver, or kidney disease. The period of follow-up was 18 months from the start of the treatment. The study was approved by the Institutional Review Board. A total of 100 Subjects that were part of an ongoing weight reducing clinic protocol using off-label liraglutide 1.2 mg daily for weight loss were divided into two groups based on their baseline FBS and HbA1c. Group A included 45 overweight subjects with pre-diabetes and group B included 55 overweight subjects with normal baseline FBS and HbA1c. Subjects’ characteristics were reviewed at baseline and assessed after 18 months of treatment. The starting dose of medication was 0.6 mg; the dose was titrated by 0.6 mg after one week to a maximum dose of 1.2 mg. The dose was decreased by 0.6-mg for intolerable side effects, then increased back to 1.2 mg daily when tolerated. All subjects were initially advised to eat a moderate-carbohydrate diet (around 45% carbohydrate, around 40% fat [<7 saturated fat], and around 15% protein) and to decrease total caloric intake by 500 kcal/day. Individuals were advised to maintain their baseline physical activity. Weight, BMI, waist circumference, blood pressure, pulse, FBS, HbA1c, lipid profile and TSH were assessed at baseline and 18 months later. Blood pressure and pulse were measured using automatic blood pressure recorder. Before measurements, subjects were seated quietly in a chair for 5 min with one arm supported at heart level. Using an appropriately-sized cuff, blood pressure and pulse readings were taken. Waist circumference was measured by placing a measuring tape around the waist at the upper point of the iliac crest and determined during minimal inspiration as previously described . HbA1c, FBS, TSH and lipids concentrations were performed by the core laboratory at AUBMC by standardized methods approved by the Centers for Disease Control and Prevention. In the pre-diabetic group, the prevalence of any of the four metabolic syndrome components  also was evaluated. The components include the following: waist circumference >102 cm in men or >88 cm in women; blood pressure ≥ 130/85 mmHg; plasma triglycerides ≥ 150 mg/dl; and plasma HDL cholesterol <40 mg/dl in men and <50 mg/dl in women. All statistical analyses were conducted using SPSS (version 20 for Windows; SPSS, Chicago, IL). Data are presented as mean ± SD unless otherwise specified. Only subjects who had end-ofstudy testing were included in the analyses. Differences between pre-diabetes and normoglycemia groups were assessed using independent t test or χ2 test. Mean differences within groups were tested using paired t tests. Statistical significance was defined as P<0.05. Adjustments were not made for multiple testing. Targeted sample size of 40 subjects in each group provided 90% power to detect a 20% difference (40 mg/dl) in SSPG concentration. A difference of 20% was chosen because this is the degree of difference in SSPG concentration seen with modest weight loss of 7% . Hundred individuals qualified for the study. Six of 45 individuals (13%) in group A discontinued the treatment during the 18 months period compared with 8 out of 55 (14%) in group B (P=0.46). The reasons for discontinuing the treatment were due to intolerance or gastrointestinal side effects related to the treatment. Therefore, 39 (M/F 5/34) individuals in group A and 47 (M/F 7/40) individuals in group B continued the treatment for a period of 18 months. All these subjects tolerated the 1.2 mg dose of medication for the whole period of treatment. As seen in Table 1, baseline characteristics were not different between the two groups. Thus, mean age of group A was older than that of group B (48+13 vs. 45+11 years; P=0.004) and mean BMI were identical between the two groups: (29.3+4 vs. 28.6+4 Kg/m2; P=0.13). Waist circumference was slightly higher in group A than group B (98+13 vs. 102+13 cm; P=0.03). HbA1c was higher in group B compared to group A (6.0+ 0.3 vs. 5.5+0.2%: P=0.003) Both groups were similar with respect to blood pressure, pulse, smoking history, family history of diabetes, TSH, lipid profile except for a lower HDL-cholesterol in A compared to group B (47+11 vs. 55+15 mg/dl; P=0.01). * aDaD is presented as mean ± SD or N/% as appropriate. **p-value for difference between group A and group B by Mann-Whitney test for continuous variables (age, SBP, DBP, lipid profile, weight/BMI/WC, TSH, FBS), and by chi-square or Fisher’s exact test for categorical variables (gender, smoking). Table 1 Baseline Characteristics of the study population. The changes in the two groups over the period of 18 months of treatment are presented in Table 2 and it shows that subjects in group A lost the same percentage weight as those in group B (5.8 vs. 7.3%; P=0.26). The percentage change in BMI was similar (5.8 vs. 7.7%; P=0.19). The percentage drop in waist circumference was less in group A compared to group B (5.1 vs. 8.1%; P=0.04). The drop in HbA1c was higher in group A compared to group B (0.3 vs. 0.1%; P=0.04). *p-value for difference in parameters between prediabetics (group A) and normoglycemics (group B) by independent t-test. Table 2 Percent drop in parameters between prediabetics (group A) and normoglycemics (group B) over the treatment period. The percentage of patients that regressed to normoglycemia in group A was 15% whereas the percentage of patients that progressed to pre-diabetes in group B was 8%. Only two subjects progressed to diabetes in group A and none in group B (Figure 1). 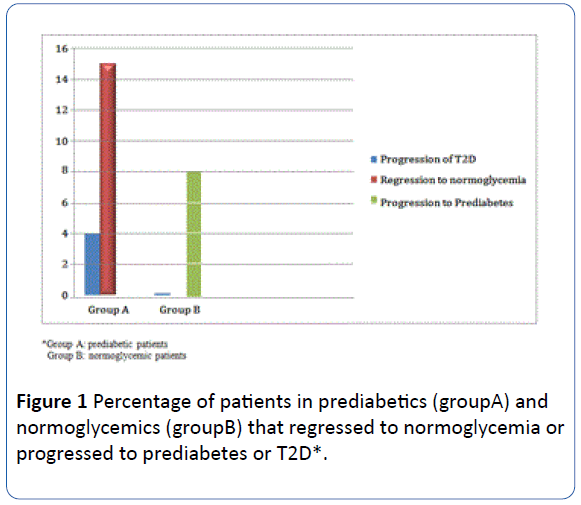 Figure 1 Percentage of patients in prediabetics (groupA) and normoglycemics (groupB) that regressed to normoglycemia or progressed to prediabetes or T2D*. The percentage of patients in group A who had any of the metabolic syndrome components was 45%. Two subgroups of A were compared: A1 (n=18) included patients with any of the metabolic syndrome components and A2 (n=21) without any such components. Table 3 shows the comparison between subgroup A1 and A2. Subjects in A1 lost more percentage weight than those in A2 (7.1 vs. 4.8%; P=0.05). The percentage change in BMI was more in A1 compared to A2 (7.2 vs. 5.0%; P=0.03). The percentage drop in waist circumference was similar in A1 compared to A2 (5.2 vs. 5.0%; P=0.4). The drop in HbA1c was higher in A1 compared to A2 (0.4 vs. 0.08%; P=0.04). *p-value for difference in parameters between both groups by independent t-test. **Group A1: Prediabetes with ≥ 1 risk factor for metabolic syndrome **Group A2: Prediabetes without risk factors for metabolic syndrome. Table 3 Percent drop in parameters over the treatment period between prediabetics with at least 1 risk factor for metabolic syndrome (group A1) and prediabetics without risk factors (group A2). The results of our study demonstrated that addition of 1.2 mg liraglutide daily to a calorie-restricted diet significantly causes more weight loss in pre-diabetic overweight subjects compared to normoglycemic overweight controls. This beneficial glycemic control in the pre-diabetic group occurred despite a lower reduction in waist circumference and a similar reduction in body weight. Moreover, in the pre-diabetic group, the presence of any of the metabolic syndrome components, resulted in further weight loss and a better glycemic control. In addition to the better glucose control, the percentage of patients that regressed to normoglycemia in the pre-diabetic group was 15% over a period of 18 months. Only two subjects progressed to diabetes in this group and no subject with normoglycemia progressed to diabetes. This is the first study to show prevention of diabetes in overweight subjects with prediabetes compared to those with normoglycemia, using 1.2 mg daily liraglutide or any other low dose of a GLP-1 receptor analog. This study also showed that the percentage of patients that progressed to pre-diabetes from normoglycemia was only 8% over a period of 18 months treatment with 1.2 mg liraglutide daily. This is a novel finding suggesting that 1.2 mg liraglutide daily would be beneficial to reduce progression to diabetes both in pre-diabetic and normoglycemic overweight subjects. The expected clinical benefits of 1.2 mg liraglutide daily in overweight diabetes include improvement in insulin sensitivity, a reduction in CVD risk factors and reduction of weight related health conditions. A meta-analysis of several clinical trials has demonstrated a consistent pattern of modest weight loss and improved glucose control and cardio-metabolic risk factors in patients with T2DM treated with GLP-1 receptor agonists . On the other hand, only a few studies have evaluated the clinical benefits of low dose liraglutide or other GLP-1 receptor agonists in non-diabetic subjects [10-12]. These studies are substantially different from our study in the design and experimental population. None of these three studies limited their study subjects to pre-diabetes, and the majority of their subjects were obese with normal glucose tolerance. This difference probably explains the improvement in glycemia and metabolic profile in our study. Astrup et al. studied the effect of treatment with different doses of liraglutide compared with placebo and orlistat in obese individuals without diabetes. All doses of liraglutide significantly increased weight loss compared with placebo and mildly improved CVD risk factors with no improvement in lipid concentrations between those randomized to liraglutide and placebo. However, there were no pre-diabetic subjects included which makes our study more specific for prediabetics treated with a moderate dose of liraglutide, namely 1.2 mg daily. Rosenstock et al. 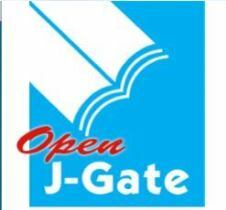 published a study whereby exenatide administered to obese subjects without diabetes. Study subjects experienced significantly greater weight loss with exenatide, there was no significant reduction in blood pressure or lipid concentrations. However they did not look specifically at the glucose or metabolic changes in any pre-diabetic subgroup of subjects. Again, a study by Elkind-Hirsch et al. showed that exenatide was associated with greater weight loss as compared with metformin in women with polycystic ovarian syndrome who may harbor a pre-diabetic state. However, they did not identify a group of patients with pre-diabetes to compare it to a normoglycemic group. This study is the closest to our study in terms of showing a beneficial effect of a GLP-1 receptor agonist in a group of overweight patients with pre-diabetes or a high risk of diabetes. As mentioned earlier, the experimental subjects in all three of these studies in which GLP-1 receptor agonists were administered to obese non-diabetic subjects differed significantly from our study in the lack of focus on the effect of this intervention in prevention of diabetes or regression from pre-diabetes to normoglycemia. From this study, it is clear that the addition of a moderate dose (1.2 mg daily) of liraglutide to a calorie-restricted diet did not lead to more weight loss in pre-diabetes compared to normoglycemia, but it lead to a better glucose control and progression rate to diabetes. It seems that the beneficial effect of 1.2 mg liraglutide is simply a function of better glucose control than the augmented weight loss. However, in pre-diabetics with additional risk factors for the metabolic syndrome, the effect of 1.2 mg liraglutide on weight loss was more pronounced than in those without any risk factor of the metabolic syndrome. This subgroup with prediabetes is considered to be at a higher risk of developing both diabetes and cardiovascular complications which makes the effect of 1.2 mg liraglutide daily in these people more important and beneficial. The benefits of weight loss in pre-diabetics have been demonstrated in few large clinical trials [4-7]. They showed that a loss of 5%-7% of weight with diet modification and exercise prevented the development of type-2 diabetes in individuals with pre-diabetes. The Finnish Diabetes Prevention Study demonstrated that 43% of individuals in the intensive lifestyle intervention arm achieved a weight loss of 5% compared with 13% in the control arm. The Diabetes Prevention Study showed that 50% of individuals with pre-diabetes randomized to the intensive lifestyle modification were lost 7% of their weight after 6 months. In our current study, the majority the subjects on liraglutide whether pre-diabetics or normoglycemics were able to lose at least 5% of their weight. Therefore, both in diabetic subjects and normoblycemic subjects with overweight, the addition of 1.2 mg daily liraglutide to a hypocaloric diet was able to provide comparable weight loss to that seen in intensive lifestyle programs used in large clinical trials. This beneficial effect was even more pronounced in the group of overweight pre-diabetics with at least one risk factor of the metabolic syndrome. Weight loss associated with 1.2 mg liraglutide treatment may lead to an improvement in the peripheral insulin resistance in this group of pre-diabetics with the metabolic syndrome. One study  evaluated the short-term effect of GLP-1 infusion in healthy, normal-weight people and found no effect on peripheral insulin sensitivity as measured by the hyperinsulinemic-euglycemic clamp. The degree of improvement in peripheral insulin resistance with liraglutide treatment was looked at and found to be equivalent to studies of weight loss of 7%-10% [15,17]. Therefore, an additional effect of liraglutideassociated glucose control may be due to improvement in peripheral insulin resistance attributable to weight loss rather than an independent effect of GLP-1 action. In addition to the earlier mentioned metabolic benefits of liraglutide-assisted weight loss, there may be direct beneficial pharmacologic effects of liraglutide independent of weight loss. A study demonstrated that liraglutide treatment can improve glucose tolerance by enhancing glucose-stimulated insulin secretion rate . In this study, 1.2 mg liraglutide treatment was associated with a decrease in fasting glucose concentration and HbA1c in both groups, but more in the pre-diabetic than the normoglycemic group. In addition, 15% of pre-diabetics treated with liraglutide had normal fasting glucose and HbA1c at the end of the study compared to less than 5% progressed to type-2 diabetes. Although it is difficult to conclude, we may speculate that the improvement in glycemia in the liraglutide-treated prediabetic subjects seems to be definitely better than that reported with weight loss in other studies [5,7,19]. The ability to normalize glucose, independent of the mode of action, may have a direct effect on decreasing the risk for type-2 diabetes . Hence, 1.2 mg liraglutide may provide additional benefits beyond weight loss and improved insulin sensitivity in the overweight pre-diabetes population. The major limitation of our study was that the study groups were somewhat small. In addition, the majority of our subjects were females but statistically equal in both groups. Regarding the drop out rate, it was less than 15% which is better than many studies with liraglutide. In patients with T2DM, the reported dropout rates for GLP-1 receptor agonists have been ≤ 25% . Astrup et al. reported a lower dropout rate (≤ 22%) in obese individuals without diabetes treated with liraglutide. The tolerance of GLP-1 receptor agonists may vary from one population and another and the moderate dose of liraglutide that we used in our study may also explain the relatively lower rate of dropouts. This is the first study to evaluate the effect of a low dose GLP-1 receptor agonist administration on glucose control and weight loss in pre-diabetic overweight subjects compared to normoglycemic overweight controls. We demonstrated that the addition of liraglutide 1.2 mg daily to calorie restriction to both pre-diabetic and normoglycemic overweight subjects resulted in a significantly more beneficial glycemic control in the prediabetic group despite a lower reduction in waist circumference and a similar reduction in body weight suggesting a beneficial effect of liraglutide independent of weight loss. Liraglutide resulted in normalization of glycemia in 15% of these pre-diabetic subjects. Moreover, in that same group, the presence of any of the metabolic syndrome components, resulted in further weight loss and a better glycemic control. Kim SH, Chunawala L, Linde R, Reaven GM (2006) Comparison of the 1997 and 2003 American Diabetes Association classification of impaired fasting glucose: impact on prevalence of impaired fasting glucose, coronary heart disease risk factors, and coronary heart disease in a community-based medical practice. J Am Coll Cardiol 48: 293-297. Karve A, Hayward RA (2010) Prevalence, diagnosis, and treatment of impaired fasting glucose and impaired glucose tolerance in nondiabetic US adults. Diab Care 33: 2355-2359. American Diabetes Association (2013) Standards of medical care in diabetes-2013. Diabetes Care 36: S11-S66. Knowler WC, Barrett-Connor E, Fowler SE (2002) Diabetes Prevention Program Research Group Reduction in the incidence of type 2 diabetes with lifestyle intervention or metformin. N Engl J Med 46: 393-403. Tuomilehto J, Lindstrom J, Eriksson JG (2001) Finnish Diabetes Prevention Study Group Prevention of type 2 diabetes mellitus by changes in lifestyle among subjects with impaired glucose tolerance. N Engl J Med 344:1343-1350. Pan XR, Li GW, Hu YH (1997) Effects of diet and exercise in preventing NIDDM in people with impaired glucose tolerance. The Da Qing IGT and Diabetes Study. Diab Care 20: 537-544. Saito T, Watanabe M, Nishida J (2011) Zensharen Study for Prevention of Lifestyle Diseases Group Lifestyle modification and prevention of type 2 diabetes in overweight Japanese with impaired fasting glucose levels: a randomized controlled trial. Arch Intern Med 171: 135-1360. Heshka S, Anderson JW, Atkinson RL, Greenway FL, Hill JO, et al. (2003) Weight loss with self-help compared with a structured commercial program: a randomized trial. JAMA 289: 1792-1798. Vilsboll T, Christensen M, Junker AE, Knop FK, Gluud LL (2012) Effects of glucagon-like peptide-1 receptor agonists on weight loss: systematic review and meta-analyses of randomised controlled trials. BMJ 344: d7771. Astrup A, Rossner S, Van Gaal L (2009) NN8022-1807 Study Group Effects of liraglutide in the treatment of obesity: a randomised, double-blind, placebo-controlled study. Lancet 374: 1606-1616. Rosenstock J, Klaff LJ, Schwartz S (2010) Effects of exenatide and lifestyle modification on body weight and glucose tolerance in obese subjects with and without pre-diabetes. Diab Care 33: 1173-1175. Elkind-Hirsch K, Marrioneaux O, Bhushan M, Vernor D, Bhushan R (2008) Comparison of single and combined treatment with exenatide and metformin on menstrual cyclicity in overweight women with polycystic ovary syndrome. J Clin Endocrinol Metab 93: 2670-2678. US Department of Health and Human Services (1996) PHS NHANES III anthropometric procedures video. Washington, DC, U.S. Government Printing Office, USA. Grundy SM, Cleeman JI, Daniels SR (2005) Diagnosis and management of the metabolic syndrome: An American Heart Association/National Heart, Lung, and Blood Institute Scientific Statement. Circulation 112: 2735-2752. McLaughlin T, Carter S, Lamendola C (2006) Effects of moderate variations in macronutrient composition on weight loss and reduction in cardiovascular disease risk in obese, insulin-resistant adults. Am J Clin Nutr 84: 813-821. Orskov L, Holst JJ, Moller J, Orskov C, Moller N, et al. (1996) GLP-1 does not not acutely affect insulin sensitivity in healthy man. Diabetologia 39: 1227-1232. McLaughlin T, Abbasi F, Kim HS, Lamendola C, Schaaf P, et al. (2001) Relationship between insulin resistance, weight loss, and coronary heart disease risk in healthy, obese women. Metabolism 50: 795. Gleysteen JJ, Burdeshaw JA, Hallenbeck GA (1976) Gastric emptying of liquids after different vagotomies and pyloroplasty. Surg Gynecol Obstet 142: 41-48. Holst JJ, Toft-Nielsen MB, Orskov C, Nauck M, Willms B (1996) On the effects of glucagon-like peptide-1 on blood glucose regulation in normal and diabetic subjects. Ann N Y Acad Sci 805: 729-736. Perreault L, Kahn SE, Christophi CA, Knowler WC, Hamman RF (2009) Diabetes Prevention Program Research Group Regression from pre-diabetes to normal glucose regulation in the diabetes prevention program. Diabetes Care 32: 158-1588. Perreault L, Pan Q, Mather KJ, Watson KE, Hamman RF, et al. (2012) Diabetes Prevention Program Research Group Effect of regression from prediabetes to normal glucose regulation on long-term reduction in diabetes risk: results from the Diabetes Prevention Program Outcomes Study. Lancet 379: 2243-2251. Niswender K, Pi-Sunyer X, Buse J (2013) Weight change with liraglutide and comparator therapies: an analysis of seven phase 3 trials from the liraglutide diabetes development programme. Diabetes Obes Metab 15: 42-54.